Happy Mother’s Day everyone!!! We wrap up a whole weekend of mommy celebration today! First of all, Epic bari Kris celebrated her son’s FIRST BIRTHDAY on Friday. Robert William Adams IV is such a joy in the Epic family so we wish him the happiest first birthday ever and a warm congrats to Kris and her hubby, Rob, for surviving their first year as parents! 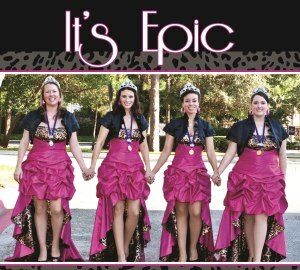 Epic hanging out in the dressing room during the Fairfax Jubil-Aires’ annual show. Now May 12th has been an important day in the Epic universe for a LONG time. 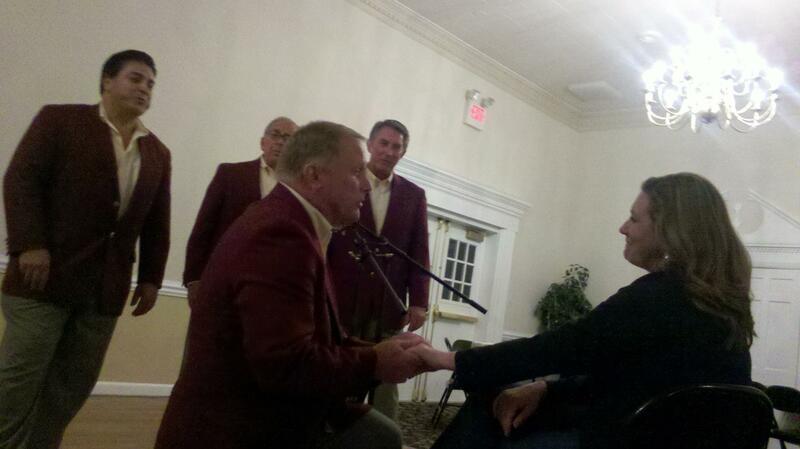 It was the first gig we booked as a quartet, and if memory serves, we may have known approximately one song when we signed the contract last year!!! The Fairfax Jubil-Aires organization is so, so, so supportive of us… they’ve adopted us! A huge thank you to them for giving us this opportunity! The theme of the show was “A Salute to Troops (and Moms)” and the script featured a through-the-ages musical journey that highlighted each of the eras of the major wars in American history. Alongside a fantastic Sweet Adelines quartet, Sound Advice, and a stunning color guard, we kicked off the show with the Star Spangled Banner. 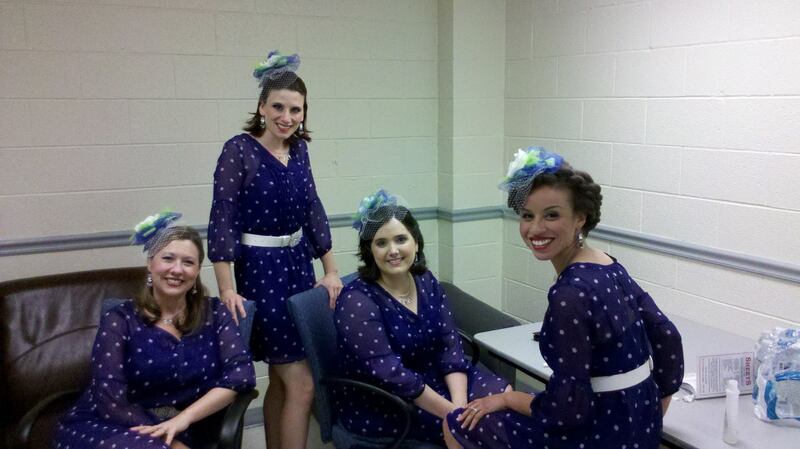 Then we sang several songs in our Andrews-Sisters-style outfits… it was fun being the USO girls!!! We were battling some vocal and physical issues as a quartet, but we fought hard through the set and delivered for both the afternoon and evening shows. In celebration of the ladies in our lives, we enjoyed having Shana’s mom, aunt and sister, Chris’s mom and daughters, Anne’s daughter and Kris’s mom in the audience during the two shows. A great way to celebrate the mommy’s-day weekend. Anne gets some special attention from Our Town! A highlight of the day for us was sharing the stage with Our Town. There’s so much star power in this quartet and they are beyond captivating. Both audiences were smitten with the quartet and we had such a fun time with them at the afterglow. Anne targeted Larry Tully for her “One More Minute” solo and asked him to pull a chair up in front of the mic so she could begin the serenade. The problem, Anne learned, is that it’s pretty hard to out-joke a jokester. Hard to out-brat a brat. She fired at him, he played along and fired back and the whole room was left laughing to the point of tears. The “pips” barely made it to the end of the song with all the laughing! When it was Our Town’s turn to sing at the ‘glow, they too invited Anne to take a chair in front of the mic. The pay-back on the serenade started out innocent enough, but eventually Our Town’s lead, Scott Brannon, ended up singing while sitting on Anne’s lap. It was awesome. We put the afterglow to bed way too late and today we revel in the success of yet another Epic adventure! Once again, we wish everyone a relaxing and enjoyable Mother’s Day. XOXO. Anne will forget stuff. Even when there’s a packing list. She just stops reading at a certain point. Shana has the best time-killing conversation topics EVER. Between-the-shows Starbucks runs seem likely to include quick stops at pharmacies for gastrointestinal relief meds. Shana and Anne’s FIRST (yes, very first!) afterglow was a memorable one, for sure. It is intimidating as heck to have an arranger of your song in the audience… especially when he arranged a great song JUST FOR YOU and you don’t want to let him down. It’s even cooler to see said arranger after the show and have him approach you with a smile that reaches all the way to his eyes when he tells you that he wasn’t disappointed (We love you Larry Wright!). Ashley Wright, who is Larry’s daughter (again, said arranger), made our learning tracks for said arrangement and she is the most stunning, smiling, talented barbershopper you could hope to meet. She was at the shows/glow and having our “learning track” in the flesh proved very helpful. She recommended Lay’s potato chips to help coat the throat a little (Chris and Kris were fighting allergies somethin’ fierce!)…. we picked up some chips on that Starbucks run and ate some chips before show #2. It worked. It was awesome. We love her. And we hate her for how much running we’ll have to do because of those chips. Anne’s lap-sitting habits will backfire if she picks a bratty enough recipient! When you hang out with a bunch of people who are as passionate about barbershop music as you are, the laughs, music sharing (ehem, song idea stealing), discussions about the art form and hugs are in limitless supply. We love Cliff Shoemaker. To pieces. Forever. He is one of the best humans we know.